Artist rendering of a brown dwarf surrounded by a swirling disk of planet-building gas and dust. The failed star, named OTS 44, is just 15 times as massive as Jupiter. An object smaller than Pluto has been discovered orbiting a dying star in what astronomers said Monday resembles a pint-sized version of our solar system. In a separate study, a disk of planet-building material was spied circling a dim star-like object just 15 times the mass of Jupiter. The brown dwarf, as it is known, is a cosmically lukewarm ball of gas that straddles the definition between planet and star. The system could evolve into a compact, dim solar system, again with a familiar look. The two findings suggest tiny, dim solar systems may be common. They also have scientists wondering anew what really constitutes a planet and what sorts of exotic worlds might harbor life. The results were presented to reporters in a teleconference from an extrasolar planet meeting held at the Aspen Center for Physics in Colorado. In one of the discoveries, an object just one-fifth the size of Pluto was called the smallest planet ever found outside our solar system. It could be viewed as a large asteroid, too. It all depends on how one sees the confusing array of orbital relationships that astronomers are uncovering. The object orbits a burned out, fast-spinning neutron star known as a pulsar. Three other roughly Earth-sized planets were already known to circle the pulsar. Their orbits are similar to those of Mercury, Venus, and Earth. Though rocky, like Earth, all four objects are considered dead worlds, because the star they circle ended its normal glowing life long ago in a massive explosion. Some astronomers prefer not to even list them in planet catalogues. The newfound small object orbits the pulsar at a distance equal to that from the Sun to the asteroid belt, which is between the orbits of Mars and Jupiter. Observations suggest it marks the outer fringe of material that went into making the miniature solar system. "Because our observations practically rule out a possible presence of an even more distant, massive planet or planets around the pulsar, it is quite possible that the tiny fourth planet is the largest member of a cloud of interplanetary debris at the outer edge of the pulsar's planetary system," said Penn State researcher Alex Wolszczan, who since 1990 has led the investigation into the system. The pulsar is named PSR B1257+12. It is 1,500 light years away in the constellation Virgo. "Surprisingly, the planetary system around this pulsar resembles our own solar system more than any extrasolar planetary system discovered around a Sun-like star," said Maciej Konacki of Caltech, who worked on the latest finding. Most of the more than 130 planets detected around Sun-like stars are large and gaseous, many of them much more massive than Jupiter. The smallest known planet around a Sun-like star is about 14 times the mass of Earth. For the most part, technology has not allowed the discovery of less massive planets, presuming they are out there. The pulsar planetary system has proved easier to probe, thanks to the central star's rapid spin and clockwork pulsation. Wobbles induced by the gravity of the orbiting objects causes slight perturbations in the pulsations. Pressed on whether an object so small could really be called a planet, Wolszczan told SPACE.com the term is "just a placeholder." Something that has the mass of one-fifth of Pluto, or twice the mass of asteroid Ceres, could be thought of as a large asteroid, he said. "I don't think that distinction is really important," Wolszczan said. "What is important that we may have found a large member of the debris orbiting the pulsar at the outer edge of the system." Whatever it's called, the newfound object and the other three roughly Earth-sized objects all orbit the pulsar in the same plane, just as the planets in our solar system -- with the exception of Pluto -- circle the Sun in much the same plane. That is "solid evidence," Wolszczan said, that the dead worlds evolved out of a protoplanetary disk, the same type of flat, dusty disk that is thought to have given rise to the comets, asteroids and planets in our solar system. At the other end of the life cycle for stars and planets, NASA's Spitzer Space Telescope has spotted a disk of potential planet-making material around a young brown dwarf. Brown dwarfs are not massive enough to jumpstart the thermonuclear fusion that fuels real stars. But they are warm enough to be detected by the infrared telescope. This one, known as OTS 44, is 500 light-years away. It is among the smallest known brown dwarfs, just 15 times the mass of Jupiter. In terms of heft, it's at the border between stars and planets, insofar as astronomers have figured out where that border is. 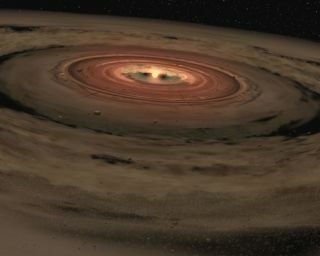 The flat batch of orbiting gas and dust looks just like a protoplanetary disk. Apparently no planets have developed yet, but the disk has enough material to create one small gas giant planet and a few Earth-sized, rocky worlds, astronomers said. "We are seeing the ingredients for planets around a brown dwarf near the dividing line between planets and stars," Giovanni Fazio, an astronomer at the Harvard Smithsonian Center for Astrophysics (CfA). "This raises the tantalizing possibility of planet formation around objects that themselves have planetary masses." In fact, astronomers have no formal definition for the term "planet" and in recent years have been arguing what exactly constitutes one at both ends of the spectrum. Several objects known to be half the size of Pluto or bigger and circling our Sun should be considered planets, some say. Or, others argue, Pluto should not be thought of as a planet. And on the upper end, theorists wonder whether an object must orbit a normal star to be considered a planet, and just how massive a planet can be before it's a dim star. About the only thing astronomers can say for sure is that almost everything they find in space seems to have the potential for an orbiting companion of some sort. And, it is becoming evident that planet formation as it is thought to have happened in our solar system may occur in a similar manner in significantly different environments. "There may be a host of miniature solar systems out there, in which planets orbit brown dwarfs," said the CfA's Kevin Luhman. For Luhman, "this leads to all sorts of new questions, like, 'Could life exist on such planets?' or 'What do you call a planet circling a planet-sized body? A moon or a planet?'"